Samuel Welham was born in Alresford, Essex, England on 28/12/1824, the eldest of Samuel & Eliza's children. He was 16 years old when the family migrated to Australia. Between 1844 - 1846, along with his father, he worked for James King at his pottery at Irrawong, north of Newcastle. He died on 4/1/1853 at Bathurst, NSW. 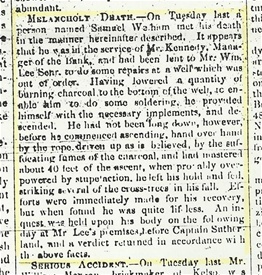 Meloncholy Death - On Tuesday last a person named Samuel Welham met his death in the manner herinafter described. It appears that he was in the service of Mr Kennedy, Manager of the Bank, and had been lent to Mr W. Lee Snr to do some repairs at a well which was out of order. Having lowered a quantity of burning charcoal to the bottom of the well to enable him to do some soldering, he provided himself with the necessary implements, and descended. He had not been long down, however, before he commenced ascending, hand over hand, by the rope, driven up as believed by the suffocating fumes of the charcoal, and had mastered about 40 feet of the ascent, when probably overpowered by stupefaction, he left his hold and fell, striking several of the cross-trees in his fall. Efforts were immediately made for his recovery, but when found he was quite lifeless. An inquest was held upon his body on the following day at Mr Lee's premises before Captain Sutherland, and a verdict returned in accordance with the above facts.